Mad Professor doing his dub thing. Dub isn't generally perceived to be the most joyous of genres, so it should come as no surprise that this week's SampleRadar collection has a dark and brooding theme. So, if you're already in full 'bah humbug' mode and want to get your mood on, go right ahead. The deep dub samples are divided into four folders containing atmospheres, beats, FX and bass loops. 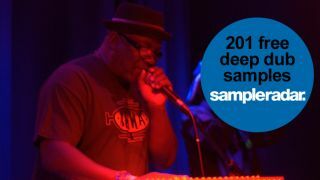 The deep dub samples are supplied in a zip file, so you'll need to extract them before you can see them. Enjoy!